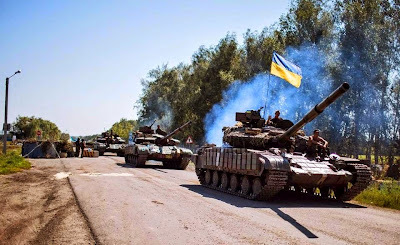 DONETSK, Ukraine -- Fighting raged Sunday on the western outskirts of Donetsk as the advancing Ukrainian army tried to seize control of the rebel stronghold. Ukrainian army set up a checkpoint near the eastern Ukrainian city of Debalcevo Sunday. In danger of being encircled, the separatists renewed their calls for Russia to send troops to their aid. To support their operations, the pro-Russian fighters have been confiscating vehicles and food from residents and businesses in Donetsk. The center of the major industrial city is all but deserted, with few people or cars on the streets and most stores and restaurants closed. A spokesman for the Ukrainian military operation, Alexei Dmitrashkovsky, told The Associated Press that government soldiers were fighting Sunday to hold positions they had taken on the edge of Donetsk, but were meeting resistance. In the part of the city closest to the fighting, an artillery shell hit a school overnight, but no one was reported hurt. "The shell went through the roof and exploded inside the building, setting off a fire, but we still don't know who fired it," said Dmitry Levonchik, a 45-year-old coal miner. "Who needs this war? What are they fighting for?" The sound of gunfire and explosions was heard just to the west. Pavel Gubarev, the self-proclaimed governor of the separatist Donetsk region, said the rebels would win quickly if Russia sent troops. "Of course it would be great to see Russian peacekeepers here: strong artillery units, tank brigades," Gubarev said. "This war would be over in a day, maybe two." Ukraine and the West say they have evidence that Russia is arming the separatists. Russia denies this and describes the Russian citizens fighting in eastern Ukraine as volunteers. The ongoing battles had delayed the start of an international search for body parts still lying in the fields where Malaysia Airlines Flight 17 was shot down on July 17 with 298 people on board. Dutch and Australian experts were able to begin their search Friday. Early Sunday, the remains and personal belongings they have found so far were delivered in refrigerated trucks to the city of Kharkiv. The recovered remains will be checked there before being flown to the Netherlands. Pieter-Jaap Aalbersberg, the head of the recovery mission, said in a statement late Saturday that the entire area around a chicken farm near the village of Hrabove has now been searched and the experts will move to other sites where aircraft wreckage was found. He previously estimated that the entire search would take at least three weeks.